On 9 August 48 B.C., one of the bravest centurions ever to lead Roman soldiers died from a sword thrust through his mouth at the Battle of Pharsalus. On 27 October 2011 A.D., that centurion returned to life. Yesterday I debuted the character of Gaius Crastinus, first-rank centurion of Caesar's favorite Tenth Legion to a group of students at The Master's Study in Indianapolis, IN. It was more fun that you could shake a pilum at! Crastinus explained that the Senate had just declared war on Caesar and his legions, but had fled to Greece under the leadership of Gnaeus Pompeius. Recruiting new soldiers for Legio X, Crastinus told them all about life in the elite legion of his day, describing the training, camp life, and of course, giving a weapons demonstration. At the end, those who showed themselves worthy by answering certain questions about the Roman army were invited to try on pieces of armor and weaponry. These new recruits were put through some of the paces of learning to form a battle line, march, and maneuver according to commands barked by centurion Crastinus. As you can see from these pictures, everyone had a great time learning about the army through this centurion whom Caesar described as being a man singulari virtute, of singular courage. It is high time to kick off this blog! Tomorrow we are on Fall Break, so I have the chance to present one of my new characters for the first time at the homeschool co-op our children attend. I will debut Gaius Crastinus, first-rank centurion of Caesar's famous Legio X. Crastinus will be speaking from a time between the end of the war in Gaul and the battle of Pharsalus, which means it is sometime in late 49 or early 48 B.C. For several years, I have portrayed a fictional character named Publius Sempronius Tuditanus, one of the guards at the tomb of Christ. The armor I wore was assembled from pieces I had received from a former student, a few gifts from my wife, and some items I had purchased. The outfit was okay, but it was incomplete and not as authentic as it could be. Thanks to a grant from the Lilly Foundation, I have been able to do considerable research into the Roman military, especially the period of the late Republic (last century B.C.). The grant also allowed me to purchase the most authentic reproduction armor. Inspired by all this, I have launched Roman Personas (full website coming soon!) as a vehicle for presenting four historical Roman characters. I will portray Cicero, Vergil, and Crastinus, and I will continue to present Tuditanus. A full line of Roman Personas products is available online (see link on sidebar), and you can follow RomanPersonas on Twitter and Facebook as well. This blog will be the home for details of upcoming and past performances, pictures, and other information about Roman re-enactment, such as my involvement with Legion XXIV. Tweets and FB will keep you updated on developments surrounding my performances and other interesting Roman facts. 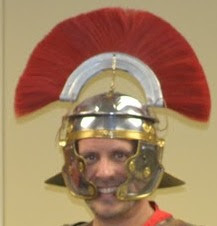 Because some pieces of armor have yet to arrive from India, I am waiting to launch the full Roman Personas website. It is ready to go and only needs a few pictures of me in the new armor before it hits the Internet. So tell your friends about Roman Personas! 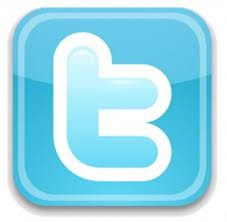 Follow us on the blog, Twitter, and Facebook! 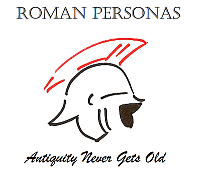 Get your Roman Personas gear and remember...Antiquity Never Gets Old!